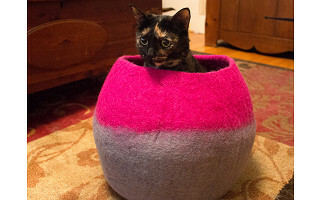 Fiona Tavernier's company, Lollycadoodle, is based in Orinda California, but her hand crafted, felted wool cat caves are sourced and made in Nepal by local artisans at a fair trade facility. Felting is a simple, centuries old process that uses heat, moisture, and agitation to create a soft, yet strong water and dirt-resistant wool material. Renewable, naturally breathable, and insulating, the same properties that make wool cozy and warm during the winter months help maintain your pet’s body temperature and minimize odor during hot summer months as well. All natural wool is even safe if your pet chews or swallows it. Let cats make themselves right at home with artfully made caves as attractive to your eye as they are to your pet. Hi I'm Fiona Fletcher Tavernier and I am the creator of Lollycadoodle Wool Pet Beds and Toys. I love wool and so will your pets! You will find that your pet discovers his/her wool bed and curls up for a nap long before you have had a chance to take the tags off. Some people think that wool is difficult to care for, but it's just not true! You hardly EVER have to wash this bed because wool fibers do not absorb dirt or odors. Also, wool fibers are hollow which makes for superior air circulation and the result is that this bed is cozy warm in the winter in super cool in the summer. This is an all-season pet bed! I am happy to answer all of your questions today. Nice product, have seen these on Etsy for years. Wool is my cat's favorite fabric, and is so easy to care for. Your great choice of colors and inclusion of mats will create a loyal following, good luck. @christine Thank you very much! We have had an amazing response to these wool beds this year. It is very exciting for us. I can thank my cat, Ginger, who is the one who started sleeping in my wool dog toy inventory! I have a 20(!) pound Ragdoll cat. Would he fit in this? @Penny I have had many Ragdoll cats fit into the Large Cat Cave. If you look at the YouTube video on Floppycats.com you will see all the Ragdool cats that have a Lolllycadoodle Cat Cave. They are such beautiful cats! How thick are the dog crate mats! @Linda The Spotty Crate Mat is about 1/4" thick. It is so durable you won't believe it. My 120 pound dog who spends a lot of time outside in the dirt has been sleeping on hers for a whole year. I have never washed it, I just vacuum it once a week and it is in perfect condition. That is saying a lot because she has torn the cover of her pillow bed with her nails (all that spinning round and round before laying down) and the wool mat does an excellent job of protecting the pillow and extending its life. I would like to find a larger one of these for my dog because she likes to burrow under a blanket. @Mark How many pounds is your dog? I do have a lot of burrowing breed dogs who love the Cat Cave. We don't have a rag doll cat, but our American short hair is very large and fat. Will she fit in the cat cave advertised here, or will I need a larger model? @george The Large Cat Cave should fit a cat up to about 14 pounds. If your cat is larger she may prefer the Small Spotty Crate Mat. How does it do with all the hair cats shed CONSTANTLY? Is it hard to get the hair off? Currently, we have FOUR cats (a little over the top for us, but each one needed a home.). And so we deal with LOTS of cat hair in our house. :(. I love that they are a Fair Trade item! @Guest Cat hair is very easy to manage using a vacuum with upholstery attachment or just a damp cloth. I have a shedding short hair and a fluffy long-hair and we don't have any trouble keeping up with the hair. I also think you will find that because the product is made of wool, you just won't notice the hair as much as you would with a woven fabric bed. It will stay clean-looking longer than a traditional cat bed. 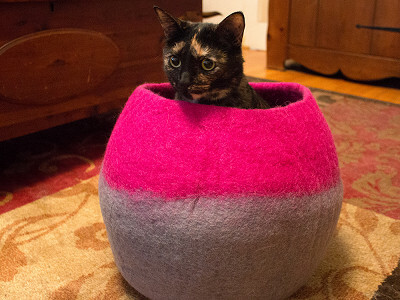 Fiona Tavernier's company, Lollycadoodle, is based in Orinda California, but her hand crafted, felted wool cat caves are sourced and made in Nepal by local artisans at a fair trade facility. Felting is a simple, centuries old process that uses heat, moisture, and agitation to create a soft, yet strong water and dirt-resistant wool material. Renewable, naturally breathable, and insulating, the same properties that make wool cozy and warm during the winter months help maintain your pet’s body temperature and minimize odor during hot summer months as well. All natural wool is even safe if your pet chews or swallows it.